When I found a home in Pasadena I had the great fortune of moving directly across the street from a woman who has since become my hero, Veronica Ferrantelli, founder of The Dog Rescuers. Sure, I guess you could say I saved Tommy; Veronica, on the other hand, has saved hundreds of dogs. The pack at her house is an ever-shifting kaleidoscope of dogs, rescued from high-kill shelters or some other horrific fate. Veronica fosters them until they’re adopted or transported to shelters far from LA County where they’ll have a much greater chance of finding loving homes. 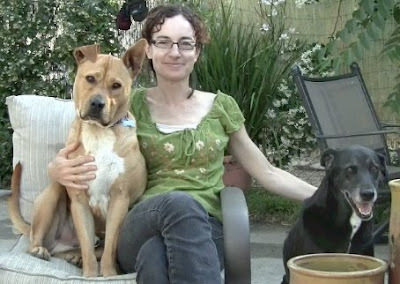 Zoe is one of three permanent members of her pack. The full pack was in the yard. And so I went and picked tomatoes, without Tommy, while ten dogs wandered around the yard keeping me company. Ten dogs! I shudder to think what would happen if Tommy’s testosterone-fueled, high-strung, bully energy were to enter the fray. And I don’t intend to find out. Before I arrive with Tommy, Veronica puts all the dogs into their respective dens in the house, except for Zoe, who has the grace and maturity to keep Tommy in his place. Zoe is noble and kind. She is also playful. She and Tommy do a flirtatious dance together—the play bow, the run and chase. If Tommy gets too riled up, Zoe warns him with a growl and a nip, and Tommy backs off. Zoe is no pushover. Unfortunately when I went by to pick tomatoes I forgot my camera, but here’s a picture from a few months ago that shows the house of doggie love. 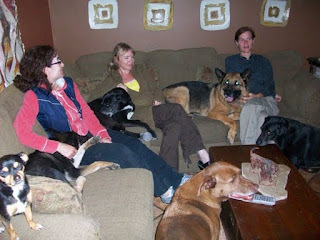 Veronica used to have two dogs: Zoe and Cooper, the handsome copper dog in the forefront. She now counts little Lola (far left) as a permanent member as well. Lucky Lola! Notice there is no Tommy in this picture. On a recent balmy evening, Tommy and I strolled down Topeka Street around dinnertime. There was a lot of activity—kids playing, neighbors out conversing—and such a pleasant summer atmosphere, until I heard a big hacking noise and then a spit come from across the street. I kept my gaze focused directly ahead so my displeasure didn’t register with the neighbors. (I find that often the most neighborly thing you can do is to keep your opinions to yourself.) But as I walked by, I snuck a peek to get a glimpse of the offender walking toward his car. Just as I did a booming voice came from the same yard. The voice came from a man seated on the porch and mostly hidden from view behind tall bushes. I could see he was leaning forward, looking at me and waiting for an answer. “A pit bull mix,” I yelled back. Spitting or no spitting, I love the comments from the neighborhood peanut gallery Tommy so often evokes. Uncle Ray, my mother’s brother, was visiting a friend in Marina del Rey a few months ago, so we arranged to meet at the Rose Café in Venice for brunch. I brought Tommy along so we could walk on the beach afterwards. When we finished brunch, Uncle Ray and Aunt Sylvia came out to the car to meet him. I opened the Mazda hatchback door, and Tommy jumped up to put his front paws over the back seat, where he was sitting, to face the action. One ear up, one ear down, he welcomed Uncle Ray with his irresistible, exuberant self. Uncle Ray laughed and moved closer to scratch him behind the ears and stroke his head, actions akin to winding up an Energizer bunny. I held Tommy’s collar to try and restrain him while, with the force of a bull, he pulled to lick Uncle Ray right on the kisser. Instead of recoiling or turning away, Uncle Ray closed his eyes, pursed his lips and moved right in on Tommy, who proceeded to slobber all over his face. Uncle Ray smooched Tommy right back, repeatedly, cooing all along. It was a regular love fest. I come from a long line of crazy dog people. One Sunday morning a few weeks ago, I was in bed just waking up when I heard a faint knock at the front door. I quickly made myself presentable and worked my way through the house, passing Tommy in the kitchen, who was on high alert—one ear pointed to the sky, brow furrowed, tail straight out behind him. At the door I was greeted by my adorable neighbor, a 4-year-old Frenchman. “Ilyas, what are you doing here?” I rarely get unexpected visitors but a 4-year-old Frenchman traveling solo was a first. I glanced around for his mom or dad but they were nowhere in sight. His eyes lit up and he nodded, with fervor this time. I may have even heard him say “Mais bien sur!” But perhaps I imagined that. Obedience class was great but it soon became clear Tommy needed individualized attention focused on behavior modification. At Penny’s recommendation I started working one-on-one with Janine Pierce of J9's K9s, and that’s when Tommy learned the command that made home life with him bearable: Go to your bed. While many dogs jump up, and some even nip, it can be a real problem when that dog is a pit bull—and he does both. I’ve done a lot of work with Tommy, but I have only one trick up my sleeve for managing him when a guest comes to the house. “Tommy, go to your bed,” I stated firmly as I escorted Illyas toward the kitchen. Tommy loves hearing this. He ran and leaped into the air and landed on his bed, turning to face us to wait expectantly for his treat. With Ilyas by my side, I went to open the cabinet, but Tommy couldn’t contain his excitement. He got out of bed and ran toward us. Ilyas nodded. What a great question, and I have to admit my heart swelled with a bit of pride at the answer. Janine called it interspecies communication, and then she’d say “isn’t that cool?” And I have to say, yeah, actually, it is cool. Lest you find my pride a bit immodest, let me assure you that for every prideful moment there are at least two to humble me. Tommy and I take frequent walks in Hahamongna and see all walks of life enjoying it when we do--horseback riders, young families hiking, people walking their dogs, and kids playing frisbee, not to mention the birds and other wildlife that thrive here. The area is a rare natural habitat, one of the few in Southern California that has not been destroyed. I feel fortunate to live in a city that has so far been committed to preserving this natural environment. It's a shame that the community is now in a position of having to fight to save it, but Hahamongna is worth fighting for, so fight we will. At the moment I'm visiting my sister and her family in central Vermont, a state committed to conserving the land. You see the wonder of that commitment in the rolling green mountains, the winding dirt roads, and the acres of small farms. I've been visiting them here for over 20 years, and each time I return I'm relieved to see that, although it has grown, the natural landscape has not been destroyed. The beauty that brought people here in the first place has been maintained. How will Pasadena look in 20 years? What will the next generation think of the city? Will people choose to live here because of a couple of soccer fields and large parking lots that provide easy access to those fields? Or will they choose to live here because the city had the foresight to preserve natural open spaces for wildlife and people alike to enjoy? The word "Hahamongna" means "flowing waters, fruitful valley" in the original native language that was spoken here. Many years after that language was no longer spoken, Einstein wrote about man's "delusion of consciousness," in that man considers himself separate from the whole of the universe. He said we must widen "our circle of compassion to embrace all living creatures and the whole [of] nature in its beauty." Let's be guided by the wisdom of those who lived and enjoyed this area long before we did and make decisions for which future generations will thank us. Instead of paving over the land, let's commit to a sustainable future where all people in the community can enjoy and cherish this natural habitat. If we don't, this open space will be gone to us forever.